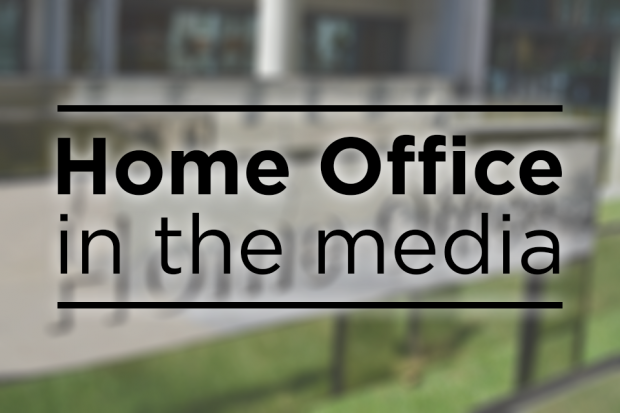 Today’s Home Office stories include on the Salisbury suspects’ interview with the state-funded broadcaster Russia Today in which they denied involvement. Elsewhere there are Home Office stories relating to European Court of Human Rights ruling that the Government’s mass surveillance of emails and internet breached citizens’ rights to privacy. There is widespread coverage, including splashes in the Telegraph and Metro, on the Russian suspects in the Salisbury poisonings who claim they are innocent and had come to the UK as tourists. Ruslan Boshirov and Alexander Petrov gave exclusive interviews with the state-funded broadcaster Russia Today, yesterday. Although the men identified themselves as Ruslan Boshirov and Alexander Petrov it was noted that neither was prepared to produce identification proving their claims after widespread reporting that the names were aliases. “The Police and Crown Prosecution Service have identified these men as the prime suspects in relation to the attack in Salisbury. “The Government is clear these men are officers of the Russian military intelligence service – the GRU – who used a devastatingly toxic, illegal chemical weapon on the streets of our country. There is prominent coverage across the national papers of a ruling by the European Court of Human Rights that the Government’s mass surveillance of emails and internet breached citizens’ rights to privacy. “The Investigatory Powers Act 2016 replaced large parts of the Regulation of Investigatory Powers Act (RIPA) which was the subject of this challenge. “This includes the introduction of a ‘double lock’ which requires warrants for the use of these powers to be authorised by a Secretary of State and approved by a judge. An Investigatory Powers Commissioner has also been created to ensure robust independent oversight of how these powers are used. There is a report in the Guardian on the Government’s announcement that children who were refused asylum after being brought to the UK when the Calais camp closed are to be granted leave to remain. The paper says that although 549 children were transferred to the UK to be reunited with family members when the camp was cleared in October 2016 a small number did not qualify for refugee status under immigration rules. The children were due to be removed from the country or given unaccompanied asylum child leave, which expires when a child turns 18. "We can be proud of our record of helping refugee and other vulnerable children affected by conflict, violence and instability, since the start of 2010 we have provided asylum or an alternative form of protection to over 31,000 children.